Early Childhood Australia (ECA) produces a variety of special titles which are separate publications to our ongoing quarterly series. These are specific titles that are needed in the sector. 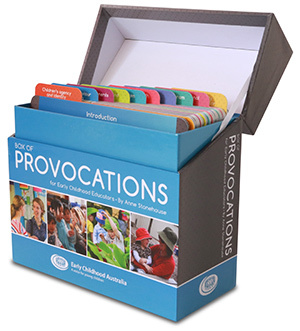 ECA Box of Provocations for Early Childhood Educators by Anne Stonehouse are a collection that are intended to support critical reflection, discussion, debate and deeper thinking about teaching, learning and what it means to be a professional educator. Their use will result in a better learning experience for children, families and educators. The provocations can be used with educators with all levels of formal qualifications and varying amounts of experience. They may work in any type of early education and care service, including centres, family day care, preschools and kindergartens, and outside school hours services. Educators can use the cards directly, and the collection can be used by directors, managers, educational leaders and other providers of professional learning for educators. To find out more information about this special title, please click here. This product is available to purchase here. 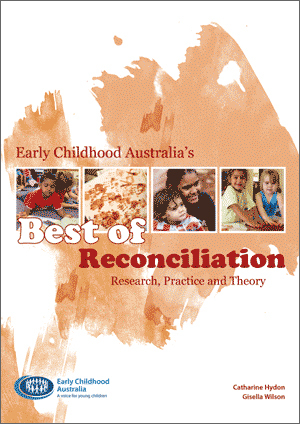 ECA Best of Reconciliation: Research, theory and practice by Catharine Hydon and Gisella Wilson, collates a range of key articles focusing on reconciliation from past editions of the Australasian Journal of Early Childhood and Every Child. This collection of articles brings to broader attention the complexities and possibilities of valuing Aboriginal and Torres Strait Islander cultural perspectives in early childhood education. Together these articles signal that the early childhood education and care sector is working together to know more comprehensively, understand more deeply and practice more effectively. ECA Best of Reconciliation: Research, theory and practice serves as a sign of hope and also a call to action—action that will turn words of recognition into practice decisions that will be known and understood now and into the future. To find out more information about this special title, please click here. A popular choice for schools and parents is First year at school, targeted at providing helpful information and guidance for children starting their first year at school. Families always have so many questions when their children are starting school. First year at school: Essential tips for parents and carers offers over 60 pages of practical and useful everyday advice to help parents and new students handle a year of changes and challenges. Written by experienced parenting experts Jenni Connor and Pam Linke, and endorsed by the Australian Primary Principals Association, First year at school: Essential tips for parents and carers is a great book for parents with children starting school. ECA Best of Sustainability: Research, theory and practice by Sue Elliott, Susan Edwards, Julie Davis and Amy Cutter-MacKenzie is a completely online publication which collates a range of key articles focusing on sustainability from past editions of the Australasian Journal of Early Childhood and Every Child. Sustainable service operation and promoting children’s responsibility and care for the environment are now part of the National Quality Standards and more importantly, all early childhood services must engage with sustainability in this time of increasing global environmental concerns. To support our role as the peak organisation in the early childhood field, we invite you to look at our ECA online shop, which stocks a variety of publications from children’s books, academic journals, ECA produced resources and much more. There are a range of topics to choose from which can easily be selected from the categories in our shop—this includes, teaching and learning resources, National Quality Framework (NQF) and Early Years Learning Framework (EYLF), inclusion, social and emotional learning, health and wellbeing and much more. All special titles are available via our ECA online shop for purchase.